Designed for upmost control type of game, the Butterfly Adrien Mattenet AMX2 table tennis bat is excellent for beginners seeking a comfortable way to learn the game at faster pace. It’s a 5-ply blade bat fitted with a flared shaped handle offering a good combination of manoeuvrability and control over the ping pong ball, and the blade is covered with a 1.7mm Addoy ITTF (International Table Tennis Federation) sponge. The bat is designed to last, offers decent spin and speed potential, yet shines mostly when it comes to control, and additionally it features a protective edging tape to prevent damage caused by impacts. 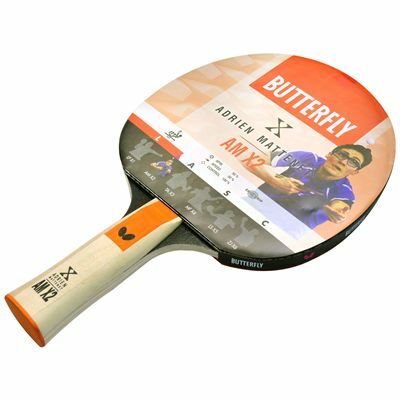 for submitting product information about Butterfly Adrien Mattenet AMX2 Table Tennis Bat We aim to answer all questions within 2-3 days. for submitting product information about Butterfly Adrien Mattenet AMX2 Table Tennis Bat. We aim to answer all questions within 2-3 days. If you provided your name and email address, we will email you as soon as the answer is published. for submitting product review about Butterfly Adrien Mattenet AMX2 Table Tennis Bat.